You are very strict when it comes to doing anything in your life, and Jupiter in the 6th house means you don’t really believe in luck. There are no such things as chance encounters or fated experiences with you, because you work hard to control everything in your existence. Jupiter symbolizes wealth, money, good luck and optimism, but for you and your high standards there is no room for anything to be left to chance. Thankfully, those closest to you know that you simply feel better about yourself when you are being useful. You attach much of your self-worth to your productivity, while other people might not even care about that. Your spiritual well-being should not come from how much you accomplish in a day, but from your relationships and personal view of the world. The Jupiter in sixth house people are so meticulous that they don’t want there to be any room for error. You take everything you do very seriously, whether it’s for work or recreation, for you want everything to be perfect. You pay attention to get every detail right, and look forward to the praise that your efforts usually warrant. (This is a characteristic of the Virgo zodiac sign). You can execute things the way you want them to be. But when other people are involved, you have to be able to let go of the reins a little and give them the same opportunity to put their spin on something. Your way is not always the best or right way, and listening to others can help you to become more efficient. This, in turn, will increase your good fortune. The only thing that gets to the Jupiter in 6th house person is when someone is critical of your work. Even the slightest criticism upsets you, and you can become very nasty to those who go against your work. It’s not intentional, but it can affect your relationships. You need to learn to relax and not take everything so seriously if you’re going to get ahead in life. And you don’t only place these high standards on yourself. You also have grand expectations for those around you, whether it’s work colleagues, friends or family. And often times they don’t live up to your approval, meaning you become critical yourself. Although you feel as if you are simply trying to help them reach their full potential, they often think otherwise. Be careful not to put people down for things that they don’t care as much about as you do. You tend to go overboard in planning and organization, which is great when no one else is involved. While it’s good that you derive pleasure in helping others, you sometimes go over the top to do so. The Jupiter in 6th house astrology suggests that you try to take a step back and let others help you for a change. It will make them feel good about themselves and take some of the pressure off of you. Those who love you don’t need you to be perfect. They simply want you to be happy too. You can create your own good luck, it’s true, but you don’t always have to be in control. In fact, you’ll feel better knowing some things are out of your hands. Learn to live in the moment because anything happen, and you want to be paying attention when it does. Sometimes good things happen to good people, and you are certainly good people. 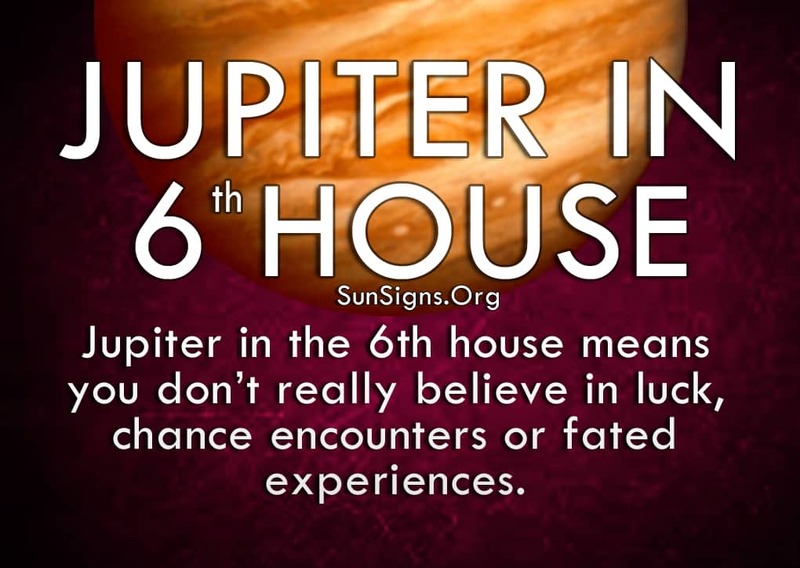 I have Jupiter in aquarius in 6th house I wonder what that means. do they say: Analysis, Evaluations and Solutions.